Everyone knows I am a big fan of Chinese sauce brand Lee Kum Kee. 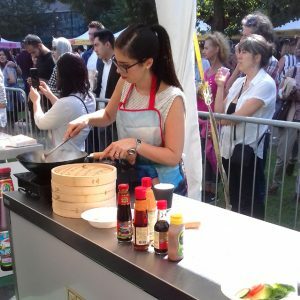 So when they contacted me to invite me to attend a cooking masterclass in partnership with the School of Wok at the Chinese Food Festival at Potters Field Park in London, I just had to go and experience this. 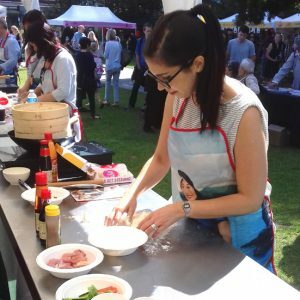 The School of Wok are based in London and provide cooking courses teaching you how to cook different oriental cuisines, including Japanese and Chinese. The tent at the food festival looked a bit like the Bake Off tent- Chinese style, with bamboo steamers and woks on induction hobs. We were going to be following the cooking instructions of Heather, our chef and using the new bao bun making kits that the School of Wok have just brought out. I was at a slight advantage here, as I have made bao once before. However, I have never followed someone cooking in real time, while trying to do it myself. It’s not as easy as you think. First we had to make the bao dough. Nice and easy as it was just the bao flour and water, adding the water little by little and kneading until the consistency is correct. We left that to rest while we marinated chicken thigh fillet and pickled some vegetables using two further packets in the bao kit as well as Lee Kum Kee’s oyster and soy sauces. We also mixed the barbecue sauce powder from the kit with water, ready for later cooking. Then came the most difficult part: making six smooth balls from our dough. It was an extremely hot day, which worked against those of us on the back row of cooking stations, as we had the direct sunlight on our work spaces and backs. In the ten or so minutes we had been preparing everything else, our dough had been sat in the full sun, drying out nicely. So despite Heather’s careful instructions of twisty, twisty, pinchy, pinchy to make perfectly smooth bao, my dough stubbornly remained rather dry and lumpy looking. As I looked at other stations in the tent, many had made their dough too wet; no such problem at ours!! After making perfect round balls (or not, as the case may be…), we had to roll them out into an oval shape and fold them in half to make our crescent bao. This I could do and the rolling made slightly smoother bao out of the lumpy balls of dough. Now onto the cooking. We seemed to be one of the few stations who managed to turn on our induction hob without help, and placed our bao in the sections of the bamboo steamer, steamed them over boiling water in the wok. Once these were done, the steamers and water were removed from the wok and we were onto stir frying the chicken. 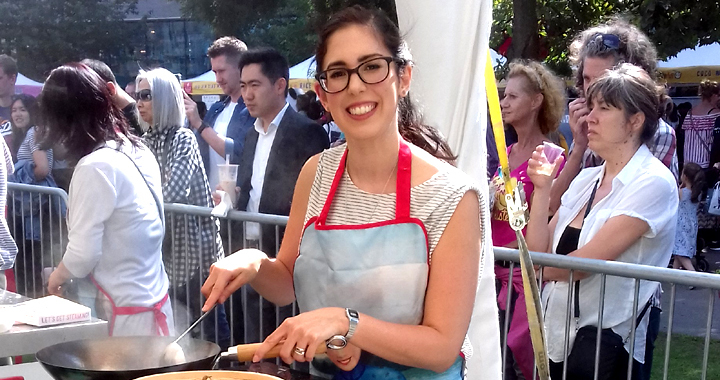 At home I use a non-stick wok for ease of use and cleaning, but using a carbon steel wok and a giant metal ladle, I might have to invest in a good quality carbon steel wok for myself, as there is something much more authentic about the cooking process and the resulting flavours. The ladle is a surprisingly useful tool for stir frying tool as well. Once the chicken was cooked, we added the sauce to the wok and stir fried it until thickened. Then it was a case of plating up our bao and filling them with the chicken mixture, salad and the vegetables we had pickled earlier. We also had Lee Kum Kee sesame dressing and sriracha mayonnaise for extra flavour. 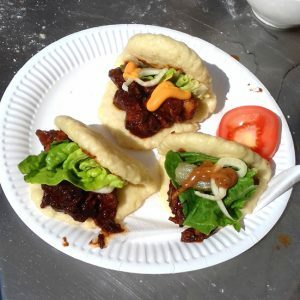 Our bao buns turned out a little lumpy looking, or ‘like fluffy clouds’ as one kind lady from the School of Wok said, but they tasted good. I have never taken a cooking class before so it was really interesting to try something new and experience a School of Wok masterclass. The chef, Heather, was friendly, easy to follow and informative. 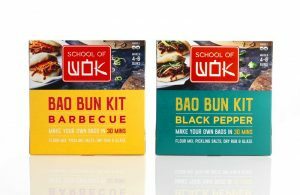 I would definitely try the bao making kits at home, though I would probably tweak how to cook it slightly by making the sauce something to add into the bao, rather than adding to the chicken, as it was very rich. 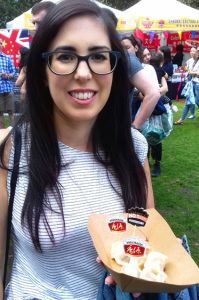 As we left the tent with our bao buns, my husband and I realised that afterwards there would be little room left for us to try lots of the other amazing looking food at the festival. As well as this, by the time the masterclass was over, lunchtime was in full swing and the park was full with long queues of people waiting for food. I did get some Freshasia steamed chicken and mushroom dumplings, which were amazing (I do love do dumplings) and tried some chicken noodles on the Lee Kum Kee stand, made with their sauces. We still enjoyed looking around the stalls at all the different food, as well as the Shaanxi culture stall with 3D printed lamps and traditional craft items, as we stayed in Shaanxi when we visited China in 2013. 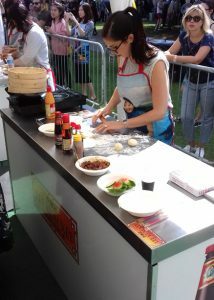 Thank-you to all at Lee Kum Kee and the School of Wok for inviting me to attend the Chinese Food Festival masterclass. Posted in Reviews, Uncategorised and tagged Bao, Lee Kum Kee, Masterclass, Review.